Last week was distinguished by Mr Bite's birthday. To celebrate, we had his usual dense chocolate mud cake. This year, though, his usual cake underwent a few adaptations to make it vegan. This wasn't Mr Bite's request (although he kindly let me experiment), but stemmed from the lack of family members to help us eat birthday cake and my recent discovery of vegan soy cream. I thought the cream would work in the ganache icing, and the other non-vegan ingredients were easily tackled using standard ingredient swaps. I relied on Mr Bite's comments to compare this version to the non-vegan ones of recent years. He said that it tasted the same, but also that this one was fudgier - denser and less fluffy. This may stem from my use of egg replacer instead of eggs, or my UK oven being different to my Australian one. It may also have something to do with me halving the ingredients to make a smaller cake. Regardless, it was still pronounced good, and having enjoyed some slices myself, I can say it is definitely fudgy and mud cake-like. 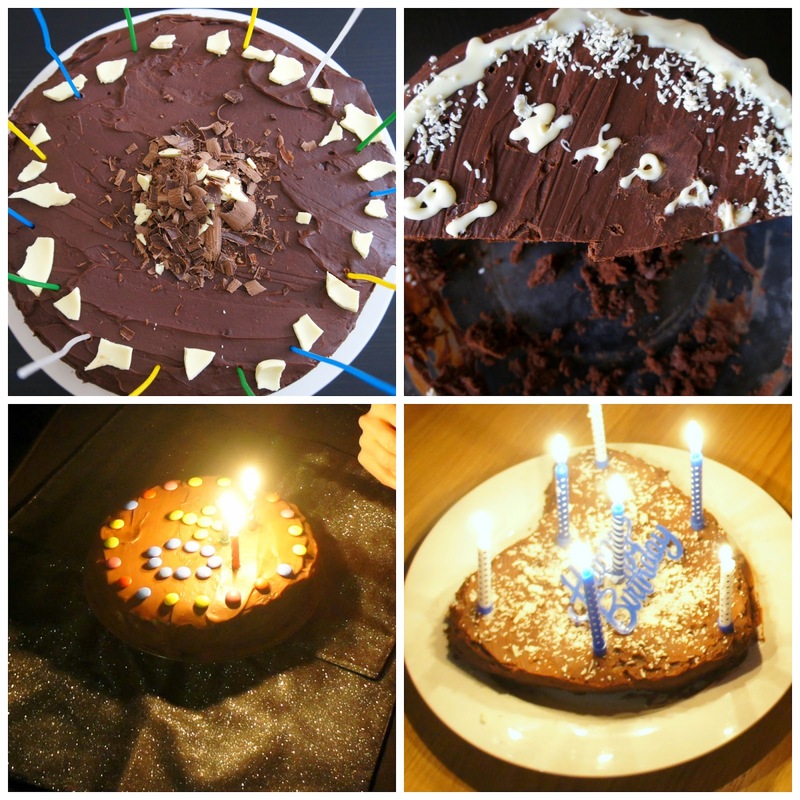 I include the recipe for the veganised cake below, but the birthday celebrations extended beyond cake. We revisited Gourmet Burger Kitchen on Mr Bite's actual birthday, where I had their vegan 'dippy hippy' burger again (aubergine, alfalfa, tomato, onions, pineapple and a spicy tahini sauce) while Mr B ventured into meat territory to try the chicken 'pesterella' burger (chicken, mozzarella, mayonnaise, rocket pesto, relish and salad). 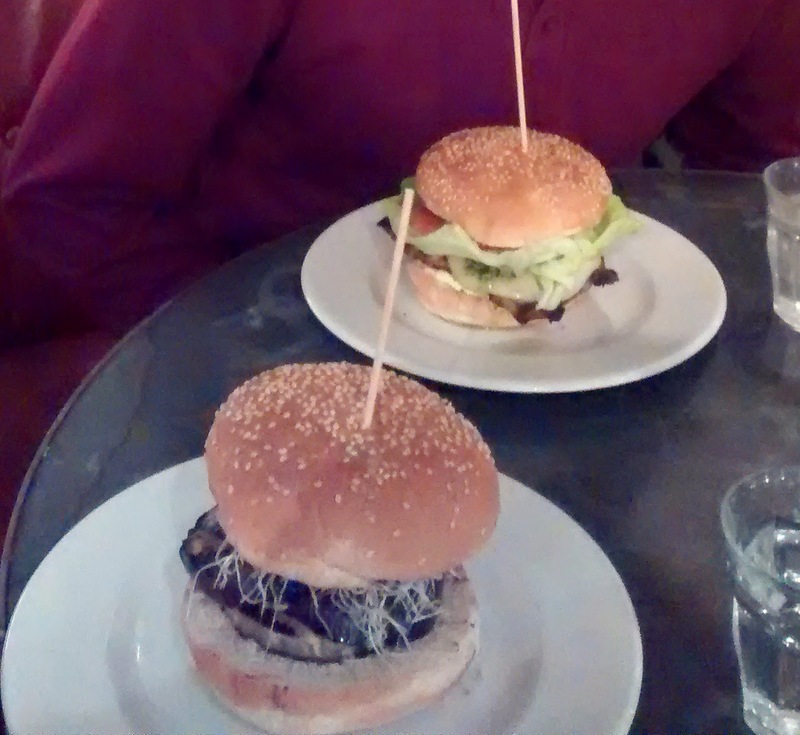 I enjoyed the vegan burger even more for eating it within a restaurant, and without the need for home reheating. Mr B. liked his so much he rated it 10/10. On the weekend, we took the celebrations out of London to take in the countryside of Surrey. 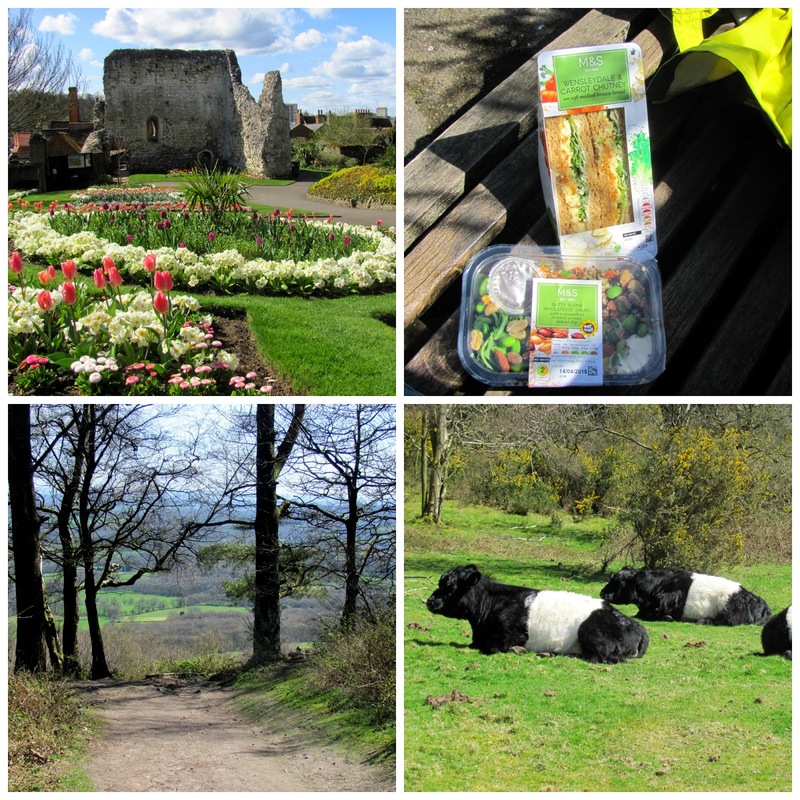 We were graced with the most incredible spring weather, and enjoyed the towns of Guildford and Haselmere as well as 14km of walking today. It has been a lovely couple of days, and I am grateful to Mr Bite for having a birthday to facilitate them. Happy birthday to him! Preheat the oven to 160'C and grease and line a small cake tin (mine was heart shaped). Beat the non-dairy spread and sugar in a large bowl until light and fluffy. Add the vanilla and egg replacer gradually, continuing to beat. Pour in the slightly cooled chocolate and beat well. Pour the batter into the prepared cake pan and bake for 28 - 32 minutes or until a skewer inserted in the centre comes out clean. Melt the chocolate, soya cream and non-dairy spread in a heatproof bowl over the stove top, or in the microwave on low power, stirring regularly. Spread over the cake and allow to chill in the fridge before serving. Have you celebrated any birthdays lately? The first few months of the year seem to have a lot of them! Happy birthday to Mr Bite. I love the sound of your cake - dense and fudgy sounds so much nicer than fluffy. And it sounds like a treat to have vegan cream to make a ganache. (I have found great success mixing chocolate, a spoon or two of nut butter and a splash of milk for a quite sticky vegan ganache) Your birthday outing looks like fun too. Ooh, I'll have to try your easier sticky ganache. Mr Bite wouldn't like the nut butter aspect, but I would! Mr Bite's cake looks magnificent, and fudgiet is good. Lucky Mr Bite! Happy birthday to Mr. Bite!! And what a fabulous cake you made him. Lucky guy! Happy birthday, Mr. Bite! Looks like you guys celebrated in the most delicious, fun, and relaxing way possible ;). Amazing place! Came here with my boyfriend for a date, and we both had an awesome time. The servings of starbucks hidden menu were huge and they have a good variety. The service was friendly and very attentive to every detail. Overall a very good experience!